← Demands for Instant Ancestors/Answers– are Pirates of the Pedigree! In the winter of 1641, just as the Puritan migration was coming to an end, a young Englishman boarded an emigrant ship for Virginia. He would have been received with high ceremony by the captain and crew, for he was no ordinary passenger. His appearance was that of a nobleman—short cloak, deep bands, great boots, belted sword, and long hair cascading in ringlets around his patrician face. His manners those of a courtier, polished by years in the presence of the King. His speech was that of a scholar, full of Oxford learning; and he had the bearing of a soldier, knighted on the field of honor by Charles I. The name of this traveler was Sir William Berkeley. In his baggage, he carried the King’s commission as Royal Governor of Virginia. his proud young cavalier was destined to rule the colony of Virginia for more than thirty years. In that period, he had a profound impact upon its development. At a critical moment, he bent the young sapling of its social system and made it grow in the direction that he wished. The cultural history of an American region is in many ways the long shadow of this extraordinary man. Fischer’s premise is this—the majority of Virginia’s military and civil leaders, the largest and most influential landowners, the most significant Virginia families, came from the upper ranks of English society. And they imported the lifeways of the England they knew to this new land: foods, clothing and hair styles, naming and speech patterns, religious practices, land use, marriages and gender folkways, house and building styles. And although some adjustments were made for the American environment where they settled, they created an elite, hierarchical society or “topping families” that firmly established English control during Berkeley’s governorship. These families and the indentured servants, who supplied the first labor force for a profitable tobacco economy, came from southwestern England—between Gloucestershire and Bristol, London and its environs, and Somerset-Devon. 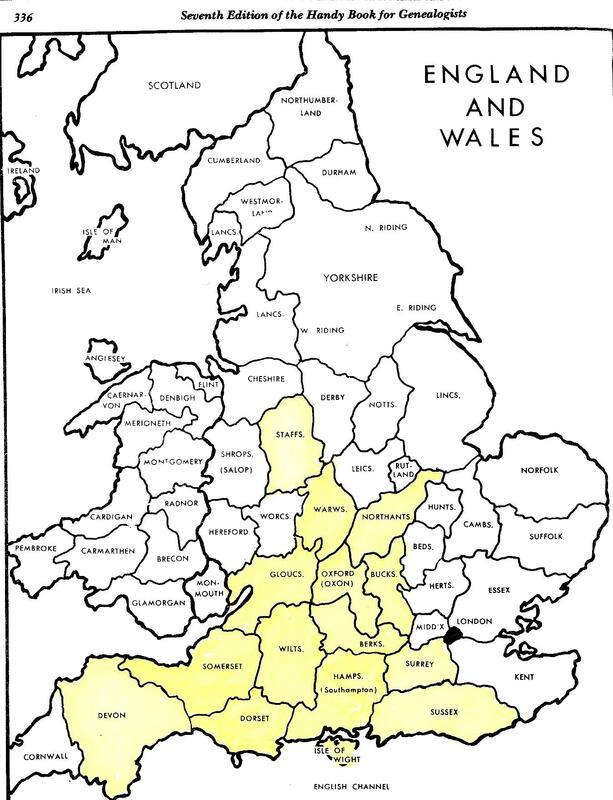 This section of England was the ancient Kingdom of Wessex where slavery was common, 865-955. It supported and remained loyal to King John in 1215. It was the area held by the Royalists in 1643, when King Charles I was seized during the English Civil War. And the stronghold of the English Clubmen’s movement, 1644-45. When the government changed hands during the English Civil War, distressed Cavaliers living in the West Country fled to America to be followed quickly by younger sons of great families who wanted to establish in the new world what their fathers had enjoyed in the old. Berkshire, Buckinghamshire, Devonshire, Dorsetshire, Hampshire, Leicestershire, Northamptonshire, Oxfordshire, Shropshire, Somersetshire, Staffordshire, Surry, Sussex, Warwickshire, and Wiltshire sent large numbers of gentry and servants to Virginia during the years 1640-1680. Between 1640 and 1660, over 30,000 immigrants arrived from England in Virginia. …tracing your ancestors from Tidewater and Southside Virginia to their origins in England will support this great migration with solid evidence of origins! Currently, I am working on a family history of a large group of families from Southside Virginia—some 100 families. Their history is now back to this important immigrant generation, the 1650’s. And I am very excited about the ultimate success of identifying their connections to southwestern England! Historical studies frequently start with a premise. The author develops the evidence that the premise is true. Too often, no examination of the actual lives of people occurs. The premise is a supposition only, shared with the public to determine if it is true. David Hackett Fischer cites the works of many historical writers to support his own research. And he provides name lists, with ranks and intermarriages. He also draws descent pedigrees showing the tight interlocking relationships by blood and marriage within the Virginia elite. Across the sea genealogies would remove all doubts of where these families come from and what level of society they inhabited before Virginia. As my own research continues, you can expect me to share origins of Virginia families as I find them. If you have a stuck genealogy in Virginia—take a leap of faith into the England described in Albion’s Seed. Albion’s Seed: Four British Folkways in America, by David Hackett Fischer. 1989. Available from Oxford University Press, 200 Madison Ave., New York NY 10016. Used copies are available in bookstores and online as well as new. Most public libraries of any size have multiple copies you can borrow. This book—all 946 pages of it—is well worth the read. Also covered in Albion’s Seed: Massachusetts, Pennsylvania and Delaware, and the Carolina backcountry. PS I have in my Virginia files, which are vast, a request for information from Mrs. Peggy Joyner, 5008 Dogwood Trail, Portsmouth, VA 23703. It is titled “German-Speaking Settlers of Augusta County Virginia.” Her project was to establish identities and collect data for these German-speaking settlers between 1738 and 1850. The data collected were to be shared in some way with interested persons by Mrs. Joyner and Katherine G. Bushman. Do any of you, my readers, know anything about this project? Was it ever completed? Shared? I do a lot of research in Augusta County—including our Eakle ancestry. Please let me know. This entry was posted in Uncategorized and tagged Origins of Virginians. Bookmark the permalink.